An ever-changing child is something that can't be avoided, so whenever I find a toy or other kid product that will serve me several YEARS, I'm always wildly excited! VTech has developed just the thing to inspire, entertain and grow right along with your child...the 2-in-1 Discovery Table. Keep reading to learn more! I reviewed the 2-in-1 Discovery Table from VTech, which retails for $39.99, but is currently on sale for $32.88 with FREE SHIPPING. 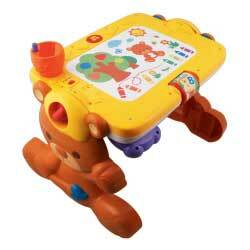 The 2-in-1 Discovery Table from VTech is an innovative toy that easily adapts to your child's various activities. 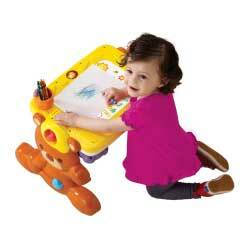 When your baby is feeling artistic, they can sit at the drawing desk and doodle to their heart's desire. When they want to play with more guidance, the table converts into an activity center featuring a piano key ruler, book , clock, shape buttons, gears and a turning pencil cup that make sounds and light up with your baby's touch. Your child will learn about colors, counting, numbers, shapes and more. This convertible table is designed for children ages 12-36 months and comes complete with an interactive learning side and a flat desk drawing side. The desk-themed learning side features a variety of interactive buttons, while the drawing side features a button to play songs. In order to convert the discovery table from one activity to the next, simply rotate the table within its frame and tighten. Too easy and too much fun! There's no doubt in my mind that Riley would have been thrilled with the VTech 2-in-1 Discovery Table when she was younger, for there are just so many activities that would have kept her entertained and having fun. 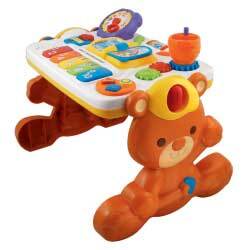 This toy would also have helped expose her to colors, numbers, music and letters. I love the versatility of this product and that it has the capability to grow right along with your child. The desk side is perfect for when their little hands want to explore drawing and scribbling and the 2-in-1 Discovery Table will actually provide YEARS of enjoyment, instead of just a few months! 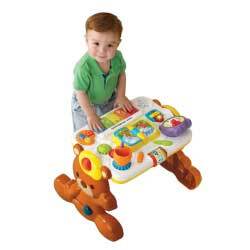 Disclosure: I received the 2-in-1 Discovery Table from VTech in order to facilitate my review. No other compensation was received. This product review is based on my own personal experiences with this item and is completely honest and objective.